A well-rounded, uplifting story: Holly O’Mahony warms to Scratchwork Theatre’s Nel at the New Diorama’s Incoming Festival. Nel, Scratchwork Theatre. Photo: Scratchwork Theatre. Live music? Tick. Physical theatre? Tick. A four-strong cast of collaborative females creating a quirky and contemporary narrative? Tick. The setup of Scratchworks Theatre’s Nel is a promising one, and it doesn’t disappoint. Nel is an introvert, a loner and a foley artist. A what? A sound effects technician, who in this case works on films. When not at work, Nel spends her time dodging social events and visits from her aunt Flora, who just wants to see her ‘happy’. To anyone equally intent on existing behind the scenes rather than on the stage, Nel is a relatable character. The most charming aspect of the play is watching Nel (Sian Keen) and her hard-working support (Alice Higginson, Laura Doble and Hanora Kamen) create the foley that Nel, in the story, is producing in her studio. Together they educate us on how crunched up dried pasta sounds like breaking bones and a ribbed hot water bottle can make the sound of car tyres screeching. But that’s not all it can do, later the same hot water bottle is also gently scraped with a fingernail to create the sound of a cat purring. It’s eye-opening, or ear-opening, perhaps, like being shown the workings of a magic trick. Scratchworks are a talented bunch, and in their collaboration you can see a fun-loving electricity run between the performer-devisers and their creation. Songs are sung in polished harmonies while light-hearted chords are strummed on ukuleles and guitars. Each song carries an thread of the narrative, such as Nel growing up without her parents, or the struggles of being an introvert. The team are hot on physical theatre too, and this is at its best when they create the vision of Nel on her motorbike, hair and coat flapping wildly in the wind. At another point, the ensemble physicalise Nel’s inner struggle to get the courage to leave the house. Like demons in her mind, all three squabble and pull her coat in different directions, while Nel stands by in bemusement. Keen pulls off Nel’s introverted awkwardness with humour, often achieved just through facial expressions. Nel makes a friend (yay!) in Bea (Doble), who is a fellow film buff, and the play ends with her seeming generally happier in herself than she did at the beginning. It’s a touching, funny show as a whole, a well-rounded, uplifting story. 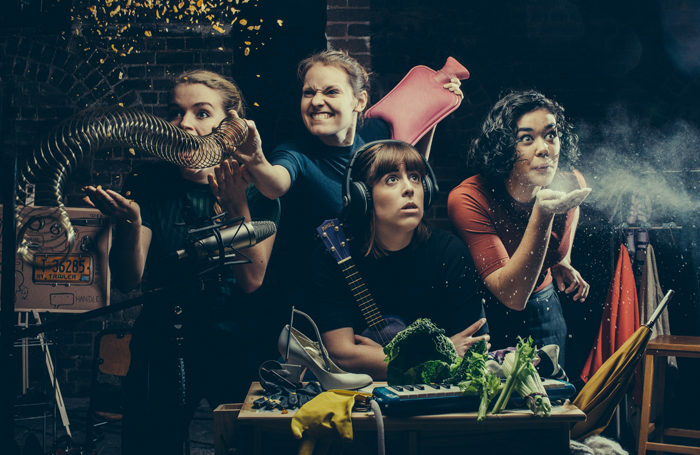 Scratchworks are fun to watch – I found myself wanting to be friends with them – and they’ve mastered the art of creating a simple story you can both giggle at and sympathise with. Nel was at Incoming Festival on June 5th. For more details, and future dates, click here.